There are many different brands of ping pong tables out there in the market. Those famous brand names are including of Joola，Butterfly, Donic, Stiga，Yasaka, and Kettler. These manufacturers are able to offer you with a variety of functions which can make you having no idea which one is best suit your needs. In fact, according to the use of ping pong table in different places, you can choose to either buying folding or unfolding table. Folding table enables you to move it around and is ease for storage; and if you are not thinking of moving the table and want it to be fixed in a location after assembly, then you can choose the unfolding table. Additionally, you can choose table with either a single fold or double fold. While speaking of outdoor ping pong table, we shouldn’t skip of mentioning Kettler which is definitely one of the leading manufacturers in the field. Kettler is a German company with its subsidiaries situated around the globe. It’s headquarter is located in Ense-Parsit. The company began its business by Heinz Kettler in Parsit in 1949. The company starting small but is now grow its business worldwide with its products being sell in more than 60 countries globally. One of the important products that manufactured by Kettler is table tennis table. Presently, the company produces and sells the ping pong table named “Atlanta” which was used in the 1996 Olympics game. The game was held in Atlanta and Kettler is the official provider for the tables. As of now, the company also has continued to develop a technology to produce outdoor ping pong table which are 100% weatherproof and at the same time preserving the bounce quality. The material used by Kettler to manufacture outdoor ping pong table top is material with the 2000T hot press molding which can be molded integrally. The dimension is very precise with 2740mm(length) x 1525mm(width) x 760mm(height); table edge is 20mm(width) and midline width 3mm ± 0.5mm. The table top generally sprays with dark blue matte green paint; table side, edge and center line painted white. A firm structure of table leg makes the table very stable and firmly connected to the ground. The middle table is featured with bezel and net where the bezel is produce with iron stamping. All legs and are link to table frame with very firm connection points in the table chassis with the use of phosphate process. With the use of electrostatic powder spraying and coating formulation product, it allows the table does not contain toxic elements which may cause harm to the health of users. Kettler outdoor ping pong tables can be placed on long-term outdoor use because it is wind, rain and snow proof. 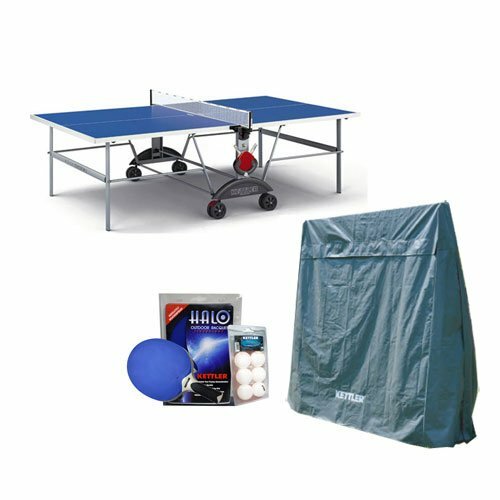 When come to buying ping pong table, a lot of people in most cases simply purchase a table when they are still not really master the game. Therefore, most of them tend not to really fully grasp of what they need or do not know what kind of table features that they want. It is rather important for you to take into account for quite a few issues prior to investing in a ping pong table, things like what is the purpose of buying the table and if there is enough space for you to place the table in the location you want it to be placed. – Should you are a beginner and just start to play ping pong, then it is good for you to purchase one from the reliable manufacturer like Kettler. – Considering the room space you have in your house and how often you going to play this sport in future. Take into account if you are going to leave your table fixed at a place after set up or you will want to fold the table up and move it to storage every time finish playing. No matter which table you choose for, either folding or unfolding ping pong table, Kettler is able to offer you with these two models and even a folding table featured with brakes and rollers. – Getting to know yourself with regards to the international standards of the table tennis table and spend some time to test them to know the features and quality of different tables. It can give you a lot of benefits when shopping and buying ping pong tables from renowned manufacturer like Kettler. The company is a top rated sport brand with a good reputation for many years. They are able to offer users with good service as well as presenting them with a high quality Kettler outdoor ping pong table with quality materials, features, design, parts and accessories. The Kettler Stockholm ping pong table is amongst the most prestigious tables manufactured by the company which has become one of the bestsellers from the company’s sport products. Apart from being robust and high quality, the table is also quite accommodating by means of easy folding and moving. This ping pong table is manufactured from heavy gauge steel that gives robustness and durability. It supports the table centrally and ensuring that the table is resilient for heavy duty. You can find some unique features with this Kettler Stockholm ping pong table simply by compare it with other tables. The issues for many ping pong tables happen to be most of them are weakly construct in the central area where the two halves of table converge. Due to this, many of these tables tend to easy get breakdown slowly. There will be no such problem with Kettler where all of its tables are built with strong central support. On top of that, one of the good features for the Kettler table is that it is always in the locked state doesn’t matter if it is in the folded position or playing position. Therefore, it totally get rid of the probability of the table for collapsing. The table lines are silk-screened which make the table to be fading and scratching resistance. Another prominent development founded by Kettler would be the ALU-TEC aluminum table tops. The engineers of Kettler uncovered constructive features of aluminum for ping pong tables as early as the 1960s. To this day, the aluminum ping pong table tops that produced by Kettler are still considered to be a revolutionary technology with regards to its advance weather resistant technology. The ALU-TEC aluminum ping pong tables are produced back in their German factory. The tables are encapsulating with polyester resin treated board in aluminum. This advance process can seals the wood permanently for many years. This creates a strong and durable use for the table and at the same time making it possible for the surface area to preserve an accurate bounce for outdoor play. The table will go through an extensive series of stability and stress tests before certified for distribution. As of now, all Kettler outdoor ping pong table tops are built with ALU-TEC. The types of materials used for Kettler aluminum ping pong table are examined with reference to both bounce behavior and their respond to a variety of weather conditions. The tables that produced by Kettler are very robust in anti-dazzle and the table surface is UV-resistant. This make possible with the special coating brought to life by Kettler. If you just bought a Kettler outdoor ping pong table but having no idea on how to set the monster up, you may read the user manual or assembly instructions that come together with the table. However, if you are having difficulty in reading the manual and still not sure how to assemble the table after gone through the instructions, then you may refer to this video and follow step by step to the things like how to open the Kettler ping pong table, how to assemble, how to unfold the table and so on. Although a ping pong net is not a piece of the most exciting part, but without it the enjoyment for playing ping pong will reduce very much. If you don’t have a table that features a net that permanently assembly and affixed on the table, you will have to select either a hand tightened screw clamp or a spring loaded clip net assembly. Most of the people are prefer of screw clamp because it provides a much sturdier construction. The screw clamp and the height of the net they are both adjustable and this enable you to adjust the net to position it at the right height. 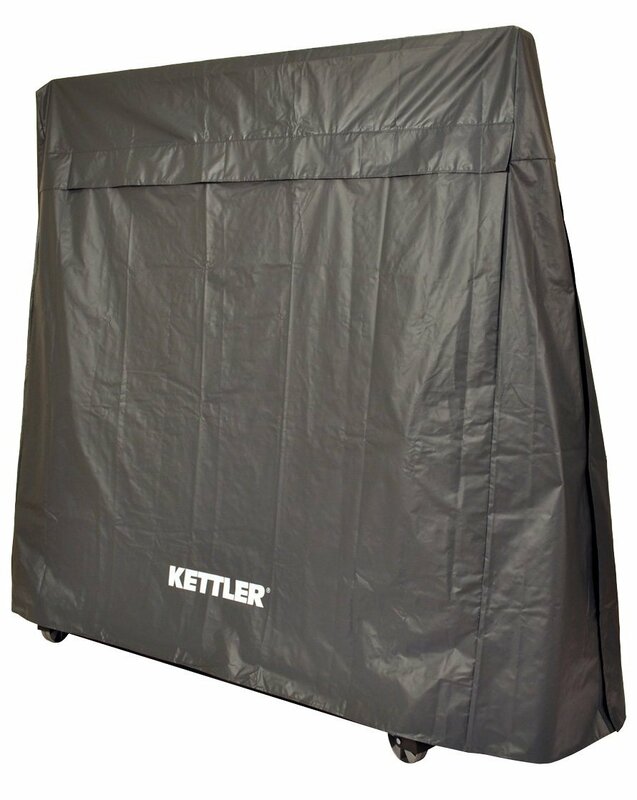 You can take a good care of your Kettler ping pong table and extend its lifespan by using Kettler Heavy-Duty Outdoor Ping Pong Table Cover. This cover is Ultra-violet Resistant with specially manufactured weather resistant backing to make the cover sturdy enough against sun, mildew, rain, mould, dirt, and snow. The cover is features with built-in air vents on the cover top, tough reinforced edges, and easy side openings with Velcro tape affixed alongside. 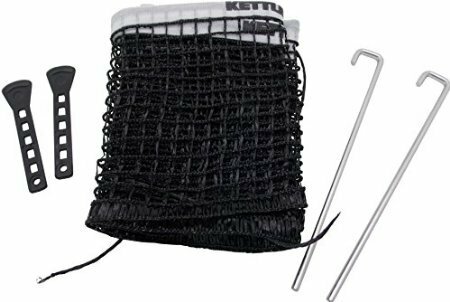 The cover is made for long time use and you will get a 2-year manufacturer’s warranty for residential use when you purchase this cover in any Kettler’s authorized sport equipment store. For a ping pong player, choosing Kettler Outdoor Ping Pong Table as the table for you to play the game wouldn’t make you wrong. It’s just matter for you to choose the appropriate product and service and the most important thing is you need to ensure all table features and requirements are met before making your purchase. Don’t know where you played ping pong that lkoeod like this but this is definitely not ping pong.Is﻿ beer pong called ping pong just because it’s played on a ping pong table?